You are currently browsing posts tagged with Amazian Jr.
President Obama’s Half-Brother May Be An Opportunist… But He’s Also, Like, Chinese! Does it make us squirm a little to learn that President Obama’s half-brother has conveniently adopted his father’s last name, just in time to promote his semi-autobiographical book about the dad he shares with our President? Yes. But does the thought of another adorable, amazian munchkin visiting Uncle Barack in the White House someday make us squeal, a lot? YUP. Welp, today is my birthday. And to celebrate, my friend sent me this adorable video of a kid taking an avant-garde approach to singing the “Happy Birthday” song: a little feedback, a little beatboxing, a little more feedback, a little freestyling, a little sampling (“Old MacDonald”), some rhythmic laughter. It’s so damn cute. So damn cute. But um, does anybody else hear his Vietnamese dad giving him the full-on shutdown? No feedback! No giggling! Stop messing around and sing the song professionally, like a respectable baby! Announcing… The WINNER Of The AMAZIAN JR. BABY PHOTO CONTEST! UPSHOT TO HOSTING A PHOTO CONTEST FOR CUTE AMAZIAN BABY PICTURES: Your ploy to collect the world’s awesomest picture gallery of cutie patooties totally works, and you realize that (phew!) your readers not only have great taste in blogs/baby clothes, but also have pretty damn good genetics. You marvel at how much better you feel knowing that your audience is even more attractive than you thought. You totally (and selfishly) feel encouraged, convinced that your own future children will be adorable. You smile a lot. You sigh a LOT. You say “awwwwwwwwwwohmygoodnessbabiesbabiesbabies!! !” over and over and over again with giggles of glee. DOWNSIDE TO HOSTING A PHOTO CONTEST FOR CUTE AMAZIAN BABY PICTURES: You realize that every photo you receive is the cutest photo you’ve ever seen. You realize that choosing between them is more difficult than picking an outfit for the first day of sixth grade. You spend many sleepless nights, tossing and turning, trying to decide which makes your heart skip more, Lily’s eyelashes or Kaiya’s Cheeks or Idris’s brows or Hero’s frown or Oscar’s bear ear hoodie. You decide to focus on photo composition and things like lighting/focus, but realize you don’t know jack about that stuff. You give up and lean on a psychic for help. But through the ups and downs, we’ve enjoyed every single frickin’ minute of our very first AMAZIAN JR. BABY PHOTO CONTEST. SO LET’S GET TO THE GOOD PART! SOPHIA!!! Okay, there are her marshmallow cheeks, dark and soft curls,and the fact that she’s a “trouble maker”–all set against a sweet floral background. But what do we really love about this photo? Sophia’s BABY GROUCHFACE! The world’s a pretty tough place, and it’s hard to look adorable when there’s so much to be cranky about (Trust us; we, uh know), but she does it so well. OH, SO WELL. Congratulasians to Sophia and her parents! We can’t wait to see you rocking your new Kumquat garb! What y’all didn’t know is that our first runner-up will be receiving a $25 Gift Certificate to Kumquat as well! Woohoo!!! PENELOPE. She’s going to hate us in 10 years when she’s a teenager that is awkward and gangly and growing in all the wrong places and grouchy about everything–particularly photos of herself in the baby bath–but we just can’t help it. 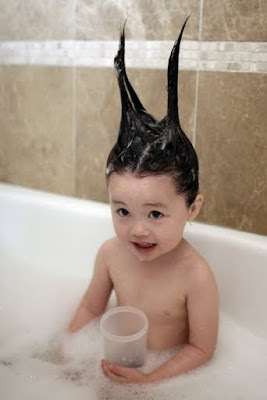 We LOVE her shampoo-hawk, and the expression on her beautiful face! Now let’s dress this clean little one in some dandy duds! Guys, we couldn’t be more serious–we struggled so much to choose between all of these too-cute photos, especially when each little face made our wombs do a cheer. They’re simply too good to keep to ourselves, so we’re sharing all of the submissions with you (click to play)! ENJOY!!! 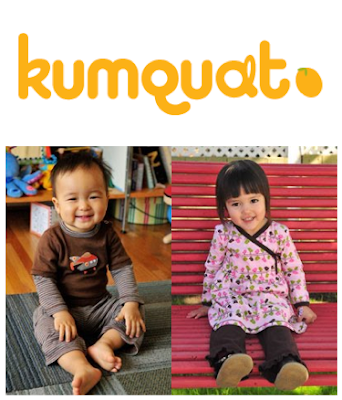 And to all of those parents out there, we highly recommend outfitting your little ones in Kumquat all day, every day. All of your cute photos will be EVEN CUTER, as if that’s even possible!!! Thank you thank you thank you, Angelyn and Jasmine! And thank you to all of those who submitted photos!!! Time is running out in the DISGRASIAN™/Kumquat AMAZIAN JR. BABY PHOTO CONTEST! The final deadline for submissions is TONIGHT: Friday, October 9 at 11:59pm PST! To those with cute pictures on hand… don’t miss the boat (and by boat, we mean the grand prize of bragging rights and a $50 Gift Certificate to Kumquat!!! We can hardly believe how many cutie patootie photos of little Amazian munchkins we’ve received over the last week. But hey, we’d be stupid not to ask for a few more. Sometimes in life, the only words that are adequate in a situation are not actually words–they’re letters of an acronym. And after hours of scratching my head, mouth agape, viewing sick video of teeny-tiny Yuto Miyazawa (a kid that picked up a guitar when he was 3, and has clearly only been playing rad axe-grinders for the six years since), I’ve realized that this is one of those sometimes.